HISD Director of Athletics Andre’ Walker has received the designation of Certified Master Athletic Administrator by the National Interscholastic Athletic Administrators Association. Through a voluntary NIAAA certification process, Walker was evaluated on his background, experience, and professional contributions. He joins an elite group of administrators who demonstrate exemplary professionalism in the field of interscholastic athletic administration. 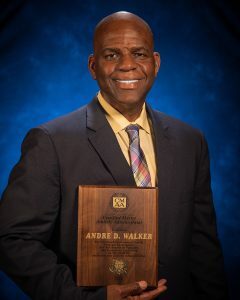 Walker has spent the past 18 years serving students in HISD as a teacher, coach, assistant principal, and most recently as a senior athletics program administrator for the district’s Athletics Department. He received his Bachelor of Science in Business Administration from Texas Southern University, Master’s in Education from Prairie View A&M University. The NIAAA is a national professional organization dedicated to promoting the professional growth of high school athletic administrators, preserving the educational nature of interscholastic athletics, and the place of these programs in the secondary school curriculum. This entry was posted in Achievement/Recognition, Athletics, News on December 12, 2018 by HISD Communications.